I'm thinking about getting a stylus for the 10.1 and I question the accuracy of the tip. It appears to be a large black ball on the tip of a pen and I really question how accurate writing notes on the tab would be. I've already thought about purely typing but there are a few note taking things (i.e. circling, starring, connecting) that you can't do. Those of you with the styluses can probably tell me... Does it work well? 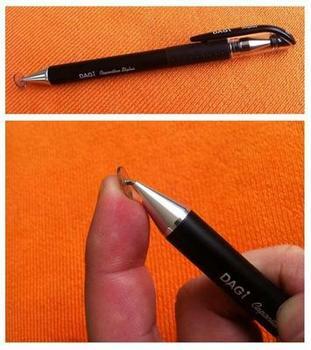 or is writing with it just a bit frustrating? And a good app suggestion, if you claim the stylus to be a good, worth-while investment, would be nice. I had one of those capacitance stylus. They are pretty good on the accuracy BUT, you'll notice a huge lag as you try writing fast. For example, as you quickly script your name you'll notice that it seems there is a "ghost writer" as it tries to keep up. If you are going to use it primarily for make annotations, highlighting and such, it will work. If you are looking to turn your tablet into a virtual notepad so you can hand write everything down, you may be disappointed in the lag as it does get annoying. As to note-taking, anyone found a really good program like the buit-in Notes on the iPud? I have a couple, but they're mostly designed to be more like Post It sized, or lists, rather than a more expansive notebook style for seminars, etc. I like handrite from the market. It has several different paper types which makes writing on a straight line easier. There is considerable lag when writing. I just got my Tab and updated TW on the same day....the pen memo app looks promising. Any reccomendations on stylus? Best Buy brand? walgreens has one for 5 bucks that is pretty nice with a good rubber tip. I will look for the ebay deal tonight. Thanks for the info. I have tried using a stylus with the notes app and it just doesn't work well. If you try to write small or fast the app messes up. I had high does and hopefully it will get updated in the future. I really think tablets need get strong pen support. I would love to see a wacom-honeycomb tablet. It might be overkill, but Adobe's Sketchbook allows you to zoom in which in turns allow you to be extremely accurate. There is no reason that you could not create your own grid as a layer, save it, and use it to guide your handwriting later. I am using one of those $1.50 styli - I can see that a better styli might be useful (especially the transparent tips), but I am not exactly limping along since it works pretty well. The recent update had an impact on typing using the keyboard, I'm wondering if anyone has any feedback on stylus based handwriting since the update and if the performance has changed at all.